Palm Reading is the ancient science of reading personality and individual traits through the shape, and lines on the hand. The future cannot be told as the lines especially are just a ‘reflection’ of the way we think, the patterns of neurons in the brain, or rivers of thought. This fascinating science can help to understand the way we individually react to the world around us, point out our strengths, and encourage us to work on our weak points, and over time we can see changes measured on our hands. It can help show us, and support us, in how we all express our unique divinity to the world. I read mainly from an office in Akaroa – 39 Rue Lavaud (upstairs beside the Brasserie) and from a home office in Pigeon Bay. Christchurch or home visits by appointment. 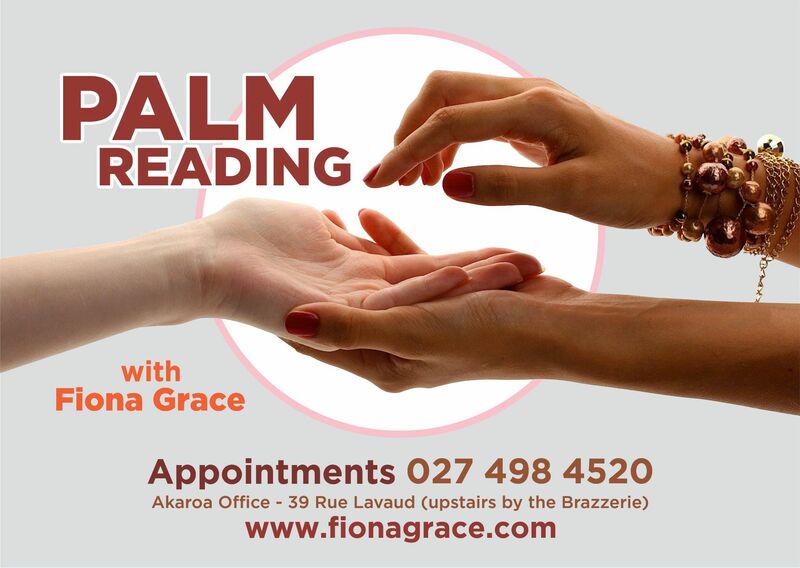 Many Airbnb guests are now having Palm Readings as an addition to their stay at my home at Pigeon Bay, Banks Peninsula. $80 a session (1 hour) with notes you take away with you.